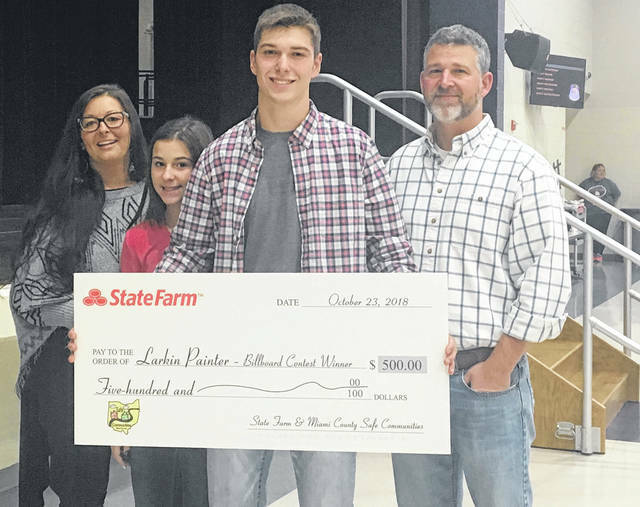 The Miami County Safe Communities Coalition awarded Bradford High School senior Larkin Painter with a $500 prize for his billboard design on Friday. Pictured (l-r) are Larkin’s mother, Sara Painter; his sister Izabella; Larkin Painter and his father, Jerame Painter; with his prize check from State Farm. BRADFORD — The Miami County Safe Communities Coalition visited the Bradford High School on Friday and brought lunch for the students after one of Bradford’s students won the coalition’s safe driving billboard contest this year. The coalition awarded Painter with a $500 prize, and his billboard design reminding drivers not to text and drive is currently on display on U.S. Route 36. The coalition — which also included representatives from the Miami County Sheriff’s Office, the Ohio State Highway Patrol and State Farm — brought the high school students pizza from Clark’s Pizza and interactive stations after lunch in order to solicit feedback from the students on how to best engage with them about safe driving techniques. “It’s an important topic that directly affects you,” Vicky Knisley-Henry, Safe Communities coordinator, said. Painter designed his billboard design, which focuses on texting and driving, as part of his digital advertising class. His media teacher for that class, Sharon Moore, noted that Painter was not required to submit the billboard design as part of the class, but he decided to do it anyway. “Texting and driving is a pretty big problem in today’s society,” Painter said, adding that he wanted to focus on that cause and encourage drivers not to be distracted while driving. Painter also thanked State Farm for giving him this opportunity along with his teacher Moore and his parents, Sara and Jerame Painter. Painter plans on attending a four-year college next year to study criminal justice. Bradford Board of Education board member Scott Besecker said that he was “very proud” of Painter’s achievement. This entry was tagged Bradford, Miami County Safe Communities Coalition. Bookmark the permalink.